Within Norfolk County, there are 15,183 water meters. Water meters are usually located inside your house on the incoming water line after the shutoff valve. There are several models of water meters currently in use in Norfolk County. The most common types in residential homes are magnetic meters and positive displacement meters. On both types of meters, the amount of water that has run through the pipe is tracked constantly. The information is then transmitted via the wire to the communication box on the outside of your house. 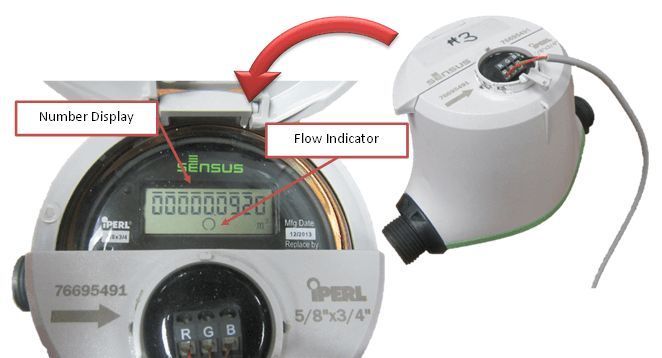 The Sensus iPerl uses magnetic technology to measure water flow. On the top of the meter box, there is a flap that you can flip up to see the digital reading. The meter shows total usage since installation on the number display, and is recorded in cubic meters. There are approximately 220 imperial gallons in a cubic meter. When the meter is registering flow, the flow indicator will have a plus sign in the centre of the flow indicator circle. If there is no flow, the circle is empty as show in the photo. If there is negative flow, there will be a negative sign. There are several different types of positive displacement meters that are installed in Norfolk County. A positive displacement meter mechanically tracks the amount of water passed through it. On the model shown below, one rotation of the large flow dial will count one cubic meter on the number display. 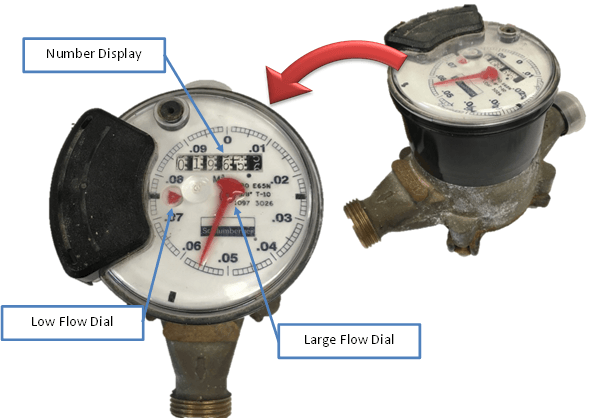 The low flow dial is a handy tool to visually assess whether there is flow through the meter or not. The dial will spin when water is moving through, and will be still when there is no water flowing. Also note that on this meter the number display has one decimal place. On this positive displacement meter, the low flow dial is located below the number display. The number display has three decimal places. 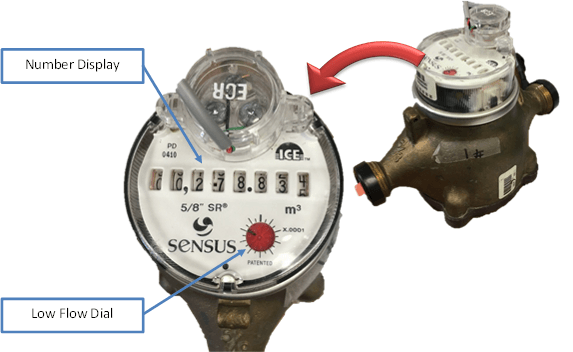 The low flow dial will spin when water is passing through the meter, with one full rotation causing the last decimal place to count up by one.